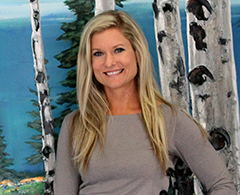 Aspen Artist Jennifer Vranes has a passion for Aspen Trees! It is her favorite subject matter to paint. This year she visited Colorado to take pictures of the changing Fall colors. This video is a little taste from her trip. Nice touch, Matt, dubbing in the John Denver guitar background. I like it. Your paintings are sure to be stunning, Jen! What a beautiful presentation. We'll buy an Aspen next, Damian really wants one.